'We need new European Commission committed to defense of Europe's borders.' — Hungarian Prime Minister Viktor Orbán. The European Parliament voted to pursue unprecedented disciplinary action against Hungary over alleged breaches of the European Union's "fundamental values." The EU accused the Hungarian government of attacks against the media, minorities, and rule of law. Gatestone Institute's Soeren Kern writes that Hungary remains "defiant" in the face of this censure, quoting Hungarian Foreign Minister Peter Szijjártó who said "Hungary and the Hungarian people have been convicted because we have proven that migration is not needed and that it can be stopped." 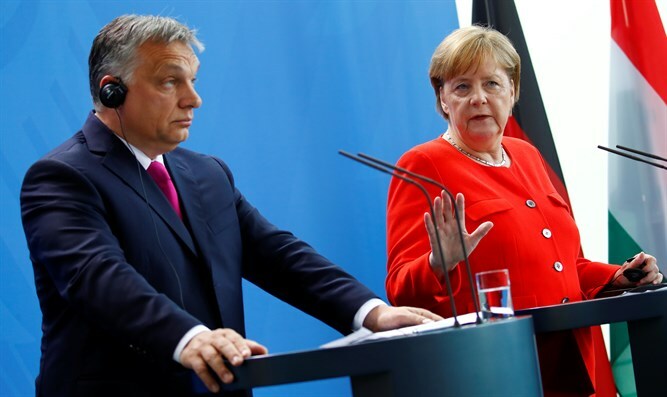 "Hungarian Prime Minister Viktor Orbán has denied the charges," writes Kern, "and said they are a retaliation for his government's refusal to take in migrants from the Muslim world. "The censure represents another salvo in a showdown between pro- and anti-EU forces over populism and nationalism ahead of European Parliament elections in May 2019. "During a session of the European Parliament in Strasbourg on September 12, MEPs voted 448-to-197 — by a margin of more than two-thirds — to trigger Article 7 against Hungary. 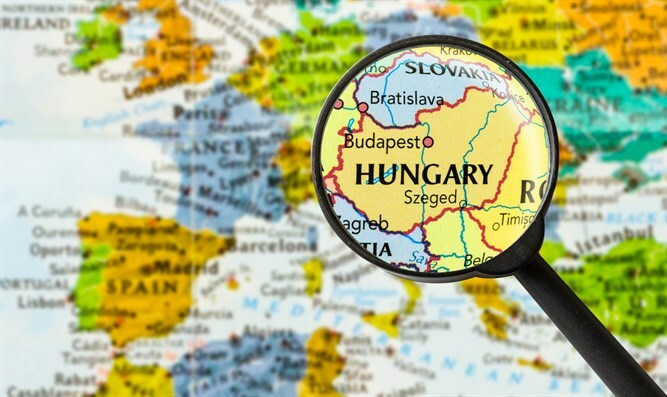 It was the first time that such parliamentary action has been taken against an EU member state; the move can ultimately lead to Hungary losing its voting rights in EU institutions. "Orbán is accused of undermining the independence of Hungary's judiciary and media; waging a legal battle against the Central European University (CEU), founded by the Hungarian-born philanthropist George Soros; mistreating asylum seekers and refugees and introducing a law that makes it a criminal offense for lawyers and activists to help them. "Article 7 is a two-step process that moves from 'preventive measures' (Article 7.1) to 'punitive measures' (Article 7.2); EU governments will now have to decide whether to impose sanctions. Hungary is likely to escape the most serious sanction of suspending the country's vote in the bloc because that would require unanimity and Poland, which has had its own run-in with the EU, has pledged to protect Orbán. "In January 2018, the European Parliament approved a non-binding resolution urging EU countries to 'swiftly determine' whether Poland is breaching EU values over judicial reforms. "The threshold for enacting Article 7 is high — it requires a two-thirds majority in the European Parliament to pass. 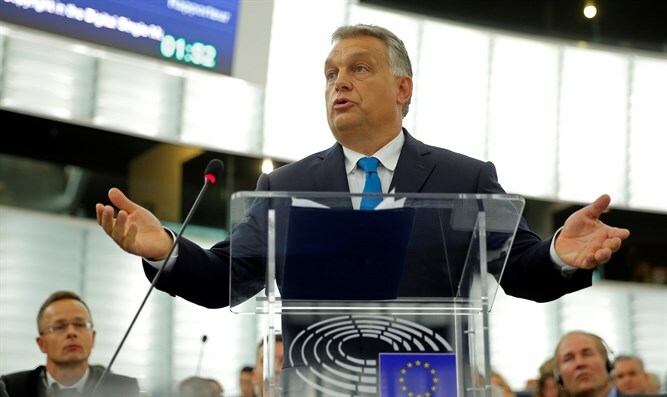 Previous attempts to hold a vote against Hungary failed because of a lack of support, in particular from the European People's Party (EPP), the European Parliament's pan-European center-right political group of which Orbán's party, Fidesz, is a member. "The vote to trigger Article 7 proceeded after EPP leader Manfred Weber unexpectedly announced his support for the move. Weber's reversal came less than two weeks after he announced his candidacy to succeed Jean-Claude Juncker as President of the European Commission. Weber's about-face is almost certainly part of an effort to garner cross-party support for his candidacy. "Weber's decision will raise questions about Orbán's future with the EPP, the largest bloc in the European Parliament, precisely at a time when he has vowed to unite other nationalists to fight against the EU's open-door migration policies. "In August, Orbán and Italian Interior Minister Matteo Salvini pledged to seek a coordinated strategy ahead of the March 2019 European Parliament elections to defeat the pro-immigration Party of European Socialists (PES), a pan-European party representing national-level socialist parties from all EU member states. The objective of the two men is to change the political composition of European institutions, including the European Parliament and the European Commission, to reverse the EU's open-door migration policies. "The Article 7 proceedings against Hungary are the brainchild of a Dutch member of the Greens party, Judith Sargentini, who steered the recommendation through the European Parliament. "This is foremost about the rights of Hungarian citizens," she tweeted after the vote in Strasbourg. "Ahead of the vote in the European Parliament, European Commission President Jean-Claude Juncker delivered his 2018 'State of the Union' address — entitled, The Hour of European Sovereignty — in which he warned of rising nationalism and the threat it poses to the European Union. 'Article 7 must be applied whenever the rule of law is threatened,' he warned. "'I know that you have already formed your opinions. I know that the majority of you will vote in favor of the report. I also know that my contribution now will not sway your opinions. Yet still I have come here [to Strasbourg] because you are not about to denounce a government, but a country and a people. You will denounce the Hungary, which has been a member of the family of Europe's Christian peoples for a thousand years; the Hungary which has contributed to the history of our great continent of Europe with its work and, when needed, with its blood. You will denounce the Hungary which rose and took up arms against the world's largest army, against the Soviets, which made the highest sacrifice for freedom and democracy, and, when it was needed, opened its borders to its East German brothers and sisters in distress. Hungary has fought for its freedom and democracy. I stand here now and I see that Hungary is being arraigned by people who inherited democracy, not needing to assume any personal risk for the pursuit of freedom. And now these people want to denounce the Hungarian freedom-fighters of the anti-communist, democratic resistance. "'I stand here now and defend my homeland, because to Hungarians freedom, democracy, independence and Europe are matters of honor. This is why I say that the report before you is an affront to the honor of Hungary and the Hungarian people. Hungary's decisions are made by the voters in parliamentary elections. What you are claiming is no less than saying that the Hungarian people are not sufficiently capable of being trusted to judge what is in their own interests. You think that you know the needs of the Hungarian people better than the Hungarian people themselves. Therefore, I must say to you that this report does not show respect for the Hungarian people. This report applies double standards, it is an abuse of power, it oversteps the limits on spheres of competence, and the method of its adoption is a treaty violation. "'Every nation and Member State has the right to decide on how to organize its life in its own country. We shall defend our borders, and we alone shall decide who we want to live with. We have built a fence and have stopped the entry of hundreds of thousands of illegal immigrants; we have defended Hungary, and we have defended Europe. Today, for the first time in the history of the European Union, we see a community denouncing its own border guards. "'Let us speak plainly: you want to denounce Hungary because the Hungarian people have decided that our homeland will not become an immigrant country. With due respect, but in the strongest possible terms, I reject the threats, the blackmail, the slander and fraudulent accusations leveled against Hungary and the Hungarian people by the European Parliament's pro-immigration and pro-migrant forces. I respectfully inform you that, whatever decision you come to, Hungary shall not bow to blackmail: Hungary shall continue to defend its borders, stop illegal immigration and defend its rights – against you, too, if necessary. We Hungarians stand ready for the elections next May, when the people will finally have the chance to decide the future of Europe, and will have the opportunity to restore democracy to European politics. '".